After just 1.5 years in existence, Dutch grocery delivery startup Picnic has nabbed a historically large Series B funding round to roll out their service to the whole of the Netherlands. The 100 million euro round came from four Dutch family funds, NPM Capital, De Hoge Dennen, Hoyberg, and Finci, and dwarfs the Series B of companies like Uber ($37mm) and Snapchat ($80mm). In a hastily called press briefing this morning – literally having called journalists the night before – the founders explained how they got to this incredible investment so quickly. During their pilot program in the pretty Dutch city of Amersfoort, they tested out their idea of approaching the logistics of grocery delivery. Starting from a distribution center where local produce is collected and parsed for delivery, the company uses custom built electric vehicles to get their wares delivered. The very happy founders in front of one their custom delivery trucks. The vehicles work in a way that’s reminiscent of old-fashioned milkmen: they follow set routes and deliver at set times, so costumers always know when to expect their fresh foodstuffs. That’s not only more efficient than how most grocery delivery companies go about it now – criss-crossing town to deliver at requested times, sometimes coming back to the same street after doing a delivery across town – but also allows Picnic to deliver for free. That same efficiency is found along the whole supply chain; the company only orders products from suppliers when a costumer has paid. And that paid off. 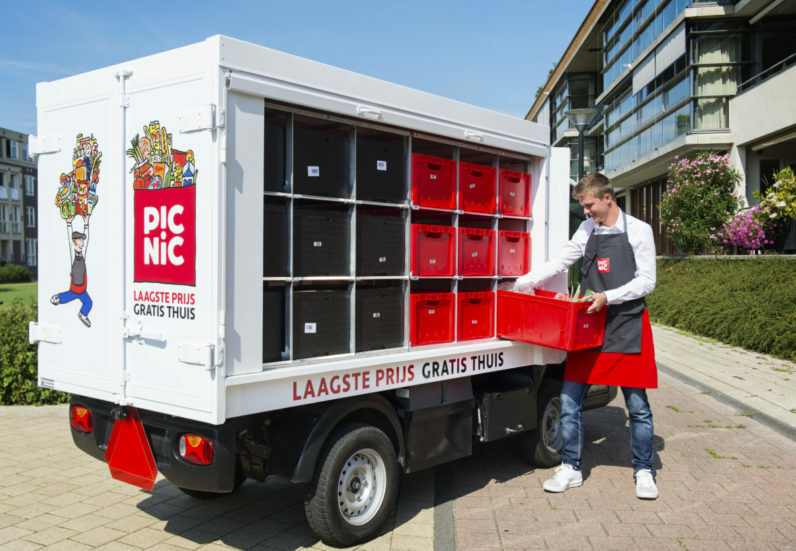 In pilot city Amersfoort, Picnic grabbed 80% of grocery deliveries from incumbent supermarkets in the area. With their new investment, the company plans to roll out service to the rest of the Netherlands, building larger and smaller distribution centers near cities and towns, and purchasing thousands of electric vehicles for delivery. On stage, co-founder Joris Beckers, promised this would lead to the creation of 10,000 jobs – both in distribution centers and in delivery. The investment isn’t only a big win for Picnic, but also for lazy people all around the Netherlands. Picnics’ CTO Daniel Gebler will be speaking at TNW Conference in May, check out our other great speakers here and don’t miss out on the Early Bird discount tickets.